The country's national voice for mammals has launched its new Mammal Mapper app today. 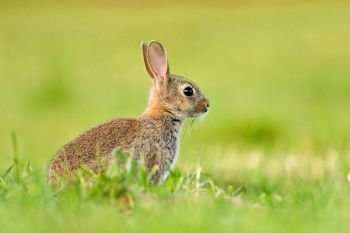 The Mammal Society, the only organisation dedicated to the study and conservation of all mammals in Britain and Ireland, wants members of the public to help record where they see mammals. Most wild mammals, including rabbits and iconic species like hedgehogs and mountain hares, are very poorly monitored. This makes it difficult to know which regions or habitats are most important, or to detect changes in their population sizes. The Mammal Mapper app is designed to record information on the location and number of animals spotted on walks or bicycle rides. Fiona Mathews, Chair of the Mammal Society and Professor of Environmental Biology at the University of Sussex, said: "What we need people to do is to go on a walk or bike-ride (an evening outing of about 45 minutes is ideal) and record the mammals they see. By recording the route taken, the app will let us work out the densities of animals in different habitats. This is a unique feature of the Mammal Mapper app and will be hugely valuable for conservation. Previously we had no way of working out whether a sighting was submitted because an animal was common, or because people were excited to see it because it was rare. It was also difficult to pin down the precise habitat where the mammal was seen. New technology means that this is all now really easy on a smartphone." Users of the Mammal Mapper can record sightings of any mammal, including field-signs like burrows and mole-hills as well as live animals. The app includes detailed guides to help identify animals by their appearance and is very easy to use. Prof Mathews added "You can use the app whenever you are out and about—perhaps walking the dog, cycling home from work, or going for a hike up a mountain. Wildlife-spotting is also a great way to keep children occupied on a walk. Information from anywhere is useful, whether it's the walk to school, your local wood, or the remote uplands." Later this month the Mammal Society will be giving people the chance to put the new Mammal Mapper through its paces during its "Big Half Term Hedgehog Watch". Look out for "Big Half Term Hedgehog Watch" posts on social media and on the Mammal Society website. The app is free to download and available on android and iOS in app stores now. Visit the Mammal Society website for more information. Is mammal DNA in the guts of blowflies a feasible mammal monitoring tool?